ICE CREAM DINO doesn’t need an intro right? HA. Singapore is a hub and melting pot for foodies, Charcoal and salty duck eggs are one of the latest trends. How about two combined into Ice-cream Dino? 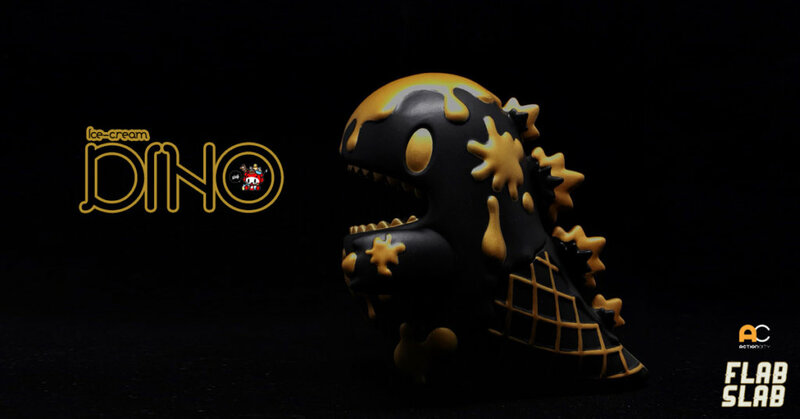 HA (if only that was the idea behind this version) Done in the usual FLABSLAB black and gold colourway, the good people at Unbox Industries have specially prepared an exclusive for fans and collectors in Singapore of DINO by Ziqi Wu. Time to call a mule or your Singapore PLUG. Priced at SGD109.90, a limited number of these black and gold pieces will be available for sale from 7pm, 13 September 2018 at the#ArtToysInvasion exhibition at @rafflescitysg For those who want their pieces signed, Ziqi will be present. Limit 1 per customer. While stocks last. But WAIT THERES MORE! Can you see something small? Micro size? Nope, we are not talking about Gary’s pee pee size, HA. MICRO TriDino! We have official confirmation that MINI DINO which first made their debut way back in 2016 HERE will be joined with the all-new Mico TRiDino and made available online in the near future.